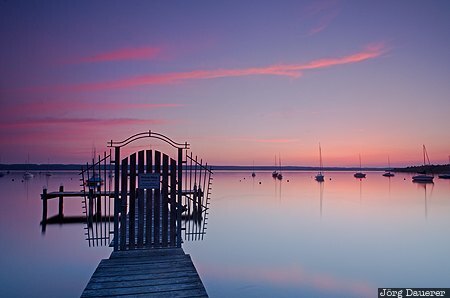 A closed gate at the end of a pier in front of a colorful evening sky an Ammersee near Herrsching. Herrsching am Ammersee is south west of Munich in the county of Oberbayern, Bavaria, Germany. This photo was taken in the evening of a sunny day in May of 2013. This photo was taken with a digital camera.